SteveLowery is vice president and director of sales for Tower Oil & Technology Co., Chicago, IL; www.toweroil.com. Lubrinomics is the science that studies the economic activity and strategies governing the production, distribution and consumption of metal-stamping lubricants. Lubricants make a major impact on the success or failure of an operation. Determining how to evaluate lubricants during a trial, learning industry best practices, and following and acting upon key metrics will help ensure overall success and improve your bottom line. Consistency and repeatability are vital components to the success of stamping operations. Steel must meet certain specifications for thickness, width, hardness and chemical makeup. Tooling designed and built to tight tolerances delivers accurate, high-quality parts. Hourly quality checks track several part dimensions. Operators follow detailed setup checklists. Proper packaging, shipping labels and routing instructions accompany every part run. But what about the lubrication? So, too, should metalformers choose the correct stamping lubricant, mixed to the proper dilution, for the job. Unfortunately, many all too often forget this step. The concentration of a water-extendible stamping lubricant remains as critical to the operation as any other inputs to the process. The simplest lubricant mixing method uses a venturi mixer, where water flow creates suction and pulls the lubricant concentrate into the water flow. Downsides: Ratio of water to lubricant can vary, and it won’t work with more viscous fluids. 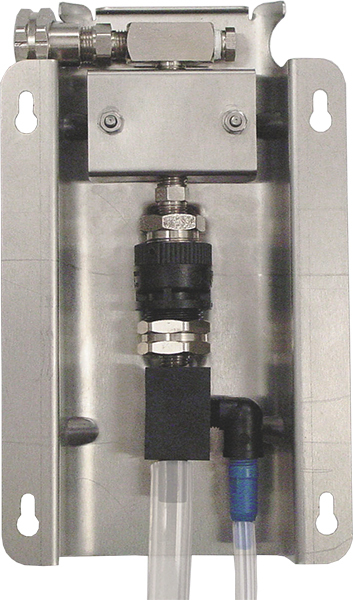 Several methods ensure a consistent mixture of stamping fluids. Check the concentration of the lubricants daily—no different than verifying material thickness or critical part dimensions. The mixing process should employ a mixing system and not be performed manually. Stampers can choose from a variety of mixing options. The simplest method uses a venturi mixer, where water flow creates suction and pulls the lubricant concentrate into the water flow. The downside to this method: The ratio of water to lubricant can vary slightly due to water pressure, lubricant viscosity and lubricant fluid level in the drum or tote. To adjust the concentration, a plug or orifice must be changed out, so a mixer is best set for one dilution. Should a second dilution be required, use a second mixer. Also, these simple mixers cannot create a strong enough venturi action with more viscous fluids. For improved performance, use a positive-displacement mixing pump, which can handle more viscous lubricants. In these types of mixers, water pressure drives a piston that pulls the proper amount of lubricant and combines it with water to provide a much tighter tolerance on the concentration. To adjust concentration, simply turn the piston to a longer stroke, injecting more lubricant into the water flow. Because all adjustments using this method are performed manually, human error can play a part. To remove the human element and other variation, a programmable, proportional mixing system will provide a consistent ratio with the touch of a button. 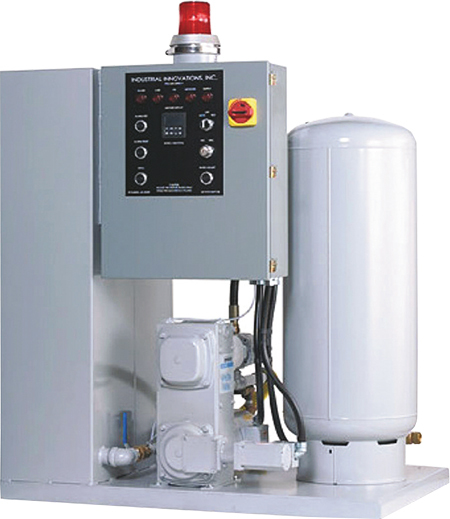 These systems can be used as stand-alone mixers, supplying a single dilution or two dilutions. They can be changed easily and locked out for adjustment only by proper plant personnel. 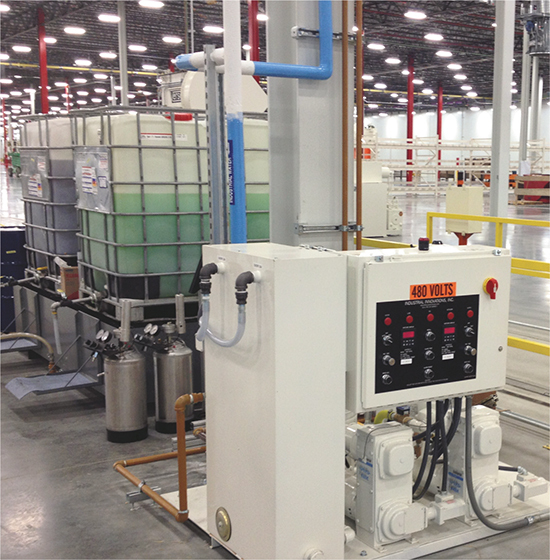 Another advantage, proportional mixing systems can connect to a plant distribution system easily, and incorporated into a pressurized delivery system for each stamping press or individual dies. All of the above-mentioned options can produce relatively consistent mixtures. Mixing a stamping lubricant to an overly strong concentration brings additional costs and possible residue issues. Too lean of a lubricant mix leads to production issues such as premature wear, part galling and poor-quality parts as well as increased die wear. Evaluate all of these mixing systems in order to match the mixing method to your process and capabilities. Once mixed, fluid often is not checked for the proper ratio of lubricant to water. Your lubricant supplier should provide a target range for the optimal performance of a specific stamping fluid. Some plants decide to run at one concentration for the entire manufacturing process, while others find that one lubricant with two ratios work best—one for tougher work, and one for light- to medium-duty jobs. Daily checks of the mix ratio are critical; use check sheets to capture the concentration for each press or workcell. Handheld or digital refractometers provide accurate readings of the process fluids. Here, a small amount of the lubricant mixture placed on the device delivers a visual reading on a scale or a displayed number that is unique for each product used. The number does not represent the percentage of stamping lubricant to water—a common misconception—but is a number that must be compared to that specific lubricant to determine the actual percentage. To remove the human element and other variation, a programmable, proportional lubricant mixing system will provide a consistent ratio at the touch of a button. For example, a stamping lubricant with a product factor of 1.6. that gives a reading of 10.0 yields a lubricant percentage of 16 percent. Your lubricant supplier can provide a technical datasheet that gives the product factor. The only time that the refractometer reading reports the true percentage is when the product factor is 1.0 (see Lubricant Percentages chart above). Also consider the chemical makeup of your stamping lubricant. Petroleum oil is the major component of water-soluble oil, along with other oil-soluble additives. This will give a higher refractometer reading, which does not necessarily indicate product efficacy. By incorporating advanced extreme-pressure and lubricity additives into the formula, a product with a lower factor may have a lower refractive index compared to another lubricant, but may perform better on tougher jobs. Therefore, the refractive index or factor is not a clear indicator of performance when comparing lubricants. Plan a stamping-lubricant test with metrics determined prior to the test. Complete as much upfront, offline testing as possible to form a reasonable opinion on the end result. When readying a test for water-extendible products, first determine the quality of the water used to mix the finished lubricant. A 10-percent mixture contains 90 percent water, so a poor water source gives your end product a bad start. 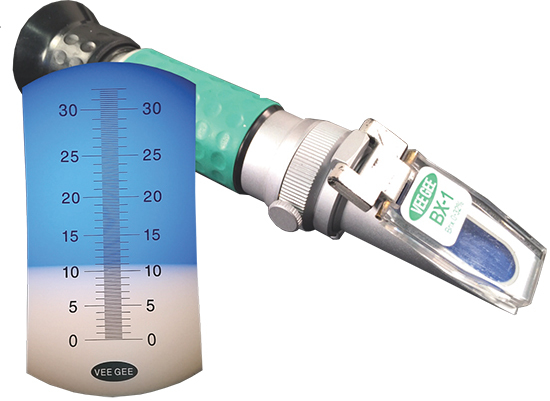 Refractometers give accurate readings of the process fluids, leading to proper calculation of lubricant-to-water ratios. All stampers should know their water-source characteristics: pH of the water; water hardness, and if it derived from calcium or magnesium; and chloride and sulfide levels, as these can affect the mixed product’s stability and corrosion control. Also, know the conductivity, as high conductivity can destabilize the mixed lubricant and lead to corrosion issues. Knowing water characteristics helps determine how to best mix a water-extendible product and what, if any, considerations to make to improve water quality or deal with it in the process. Residue chara cteristics of the test lubricants can be evaluated on material coupons long before stamping out the first piece-part. Gather a sample lot of all materials used, and apply the mixed lubricant to the material. This gives a representative sample of the type of residue the lubricant will leave once it dries. Is the residue oily, sticky, tacky, dry to the touch or waxy? These material coupons then can be transferred to applicable secondary processes for the parts. Send them through cleaning, deburring, welding and sample packaging to determine the interaction of the proposed lubricant. Perform tests at a few predetermined ratios, such as 25-, 15- and 10-percent dilutions, to see how each dilution affects the process. Scientific laboratory tests also provide a real-world lubricant comparison. For example, the twist compression test uses a rotating tool-steel cylinder and a material coupon, along with a hydraulic force, to measure friction and provide a lubricant comparison. Pressures and speeds can be adjusted to mimic the stamping process. 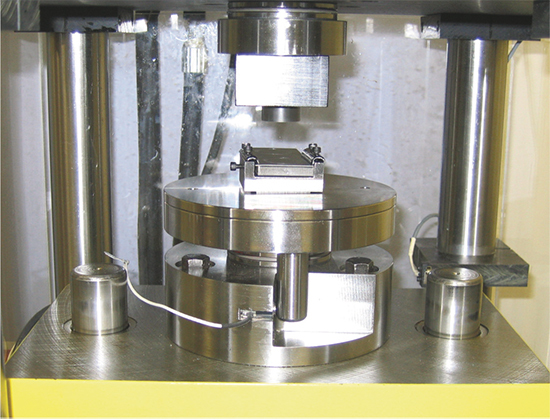 The test does not simulate the actual stamping processes, but the results derived correlate well with fieldtesting performed on actual stamping dies. This preliminary testing can give confidence to proceed with the trial, offering knowledge that failures will be minimized or eliminated. Actual stamping trials involve much more than just filling the application system with a new lubricant and running parts. Do not gauge success upon a proposed lubricant making or not making the part. Determine and monitor preliminary metrics prior to the test, and during the new-lubricant test. Parts made with the current lubricant must be gathered, marked and set aside for later comparison. Commonly used in lubricant trials, the twist compression test uses a rotating tool-steel cylinder and a material coupon, along with a hydraulic force, to measure friction and provide a lubricant comparison. Pressures and speeds can be adjusted to mimic the stamping process. What is the die-maintenance schedule for the chosen tool that will run the test lubricant? Has it recently been serviced, or is it near the end of its normal production run? This factor alone can determine the success or failure of a lubricant trial. The volume and frequency of lubricant application must be known prior to the test, so that during the lubricant trial, if the volume can be reduced, or the frequency extended, cost savings can be ascertained. Just as importantly, know if the volume must be increased or the frequency reduced, as this results in additional cost, and possibly additional residue or other issues in cleaning and welding. With a lubricant trial underway, compare the actual parts produced via the previous lubricant to the new-lubricant parts coming off of the press. Is there a visible difference between the parts? Have burrs appeared or disappeared? Are the formed areas more or less shiny? Have cracks developed or now become unnoticeable? The successful stamping of parts represents just the first step in a positive lubricant trial. Parts must be moved to subsequent operations and monitored. During welding, is there less or more smoke? Are the welds equally as strong or weaker? Do the parts clean easier, or are they more difficult to clean, requiring more time or a higher wash temperature? Is the residue acceptable after 24 hr. compared to the previous lubricant? While the purchase price of the lubricants is one factor to compare, the entire process flow truly determines overall lubricant costs. If switching from a soluble oil where parts must be washed prior to welding, to a cleaner synthetic lubricant where parts can go directly to welding without washing, an entire process step has been removed and cost pulled out of the part. If the synthetic-lubricant purchase price is less, then it is a home run, but if it costs more per gallon, factor the costs of the washing step into total cost. Know the difference between price and cost. A cheap, inexpensive lubricant at first may seem the way to go, but additional processes or steps may be required to use it. Actual running ratios tell a better story. There is the purchase price per gallon, and then there is the actual-use cost per gallon.